Hobo, W., Norde, W. and Dolstra, H. (2012). Ex vivo Human Antigen-specific T Cell Proliferation and Degranulation. Bio-protocol 2(23): e304. DOI: 10.21769/BioProtoc.304. 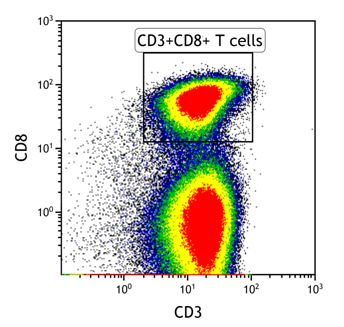 Proliferative capacity and degranulation are important features of antigen-specific CD8+ T cells. 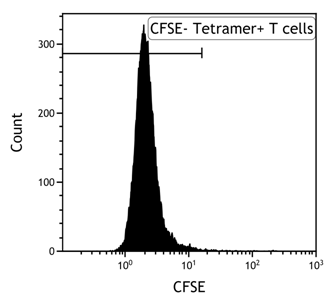 By combining tetramer staining with a CFSE staining, we were able to enumerate the total number of antigen-specific T cells, as well as their number of divisions upon antigen-specific stimulation during a week. In addition, we performed restimulation of these cells, to analyze their ability to secrete cytolytic granules, visualized by CD107a staining. Note: The above antibodies have been tested by the author and may be substituted with the antibodies desired by users. Wash PBMC containing low percentages of antigen-specific T cells with 14 ml PBS. Centrifuge the cells for 5 min at 500 x g at room temperature (RT). Resuspend the cells in PBS to a concentration of 20 x 106 cells/ml, and add 2.5 μM CFSE at a 1:1 ratio (so in case of 500 μl cell suspension, add 500 μl 2.5 μM CFSE). The end concentration of CFSE will be 1.25 μM. Incubate the cells for 10 min at RT. Then, add pure FCS at a 1:1 ratio (so in case of 1 ml CFSE-cell suspension, add 1 ml FCS). After 2 min, wash the PBMC twice with 14 ml of IMDM/10% HS (centrifuge the cells for 5 min at 500 x g at RT), and count the cell number. Resuspend the PBMC to a concentration of 2 x 106 cells/ml in IMDM/ 10% HS. Plate 500 μl PBMC suspension per well of a 24-wells plate. Use mature monocyte-derived DC expressing the correct HLA-molecule for stimulation. Wash the DC with 14 ml PBS. Centrifuge the cells for 5 min at 500 x g at RT. Resuspend the DC subsequently in 500 μl IMDM containing 10 μM antigen-specific peptide. Incubate the DC for 30 min at 37 °C in the incubator. Add 14 ml PBS to the DC. Resuspend the DC in IMDM/10% HS to a concentration of 0.2 x 106 cells/ml. Add 500 μl DC suspension to each well containing CFSE-labeled PBMC. Culture the cells in the incubator at 37 °C, 5% CO2 and 95% humidity. After 5 days, remove from each well 500 μl supernatant and add 500 μl IMDM/10% HS containing 100 U/ml IL-2 and 10 ng/ml IL-15, so the end concentration in the wells will be 50 U/ml IL-2 and 5 ng/ml IL-15. 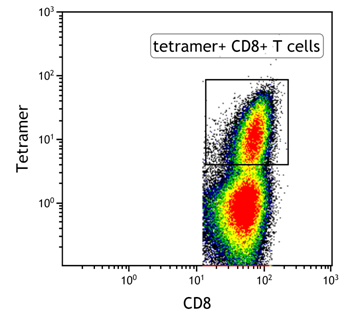 Supernatants can be used for cytokine analysis. At day 7 of culture, 500 μl supernatant was removed. Add to each well 500 μl IMDM/10% HS containing 10 μM antigen-specific peptide, so the end concentration is 5 μM Antigen-specific peptide. In addition, add 6.5 μl CD107a-PE antibody to each well. Culture the cells overnight in the incubator at 37 °C, 5% CO2 and 95% humidity. The following day, harvest the cultured cells and count the cell numbers. Centrifuge the cells for 5 min at 500 x g at room temperature. 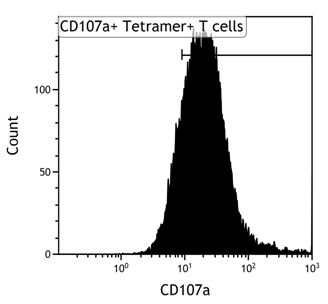 Resuspend the cells in 100 μl IMDM/10% HS and add 1 μl APC-conjugated antigen-specific tetramer. Incubate the cells for 20 min in the dark, at RT. Then (without prior washing! ), add 2.5 μl CD3 PE-Cy7 and 1 μl CD8 Alexa-Fluor-700. Incubate the cells for 30 min at ice, in the dark. 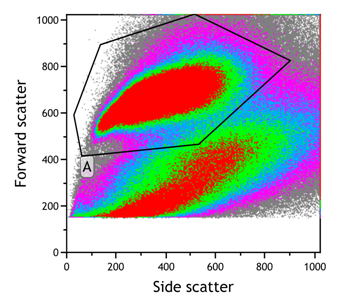 Subsequently, wash cells with 1 ml FACS buffer. 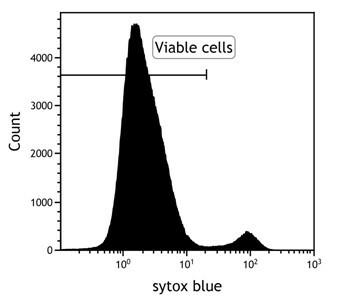 Resuspend the cells in 300 μl FACS buffer containing 0.1% Sytox blue solution. Analyze the samples on the Navios flow cytometer. This protocol has been adapted from the publication by Hobo et al. (2012). We thank Rob Woestenenk for assistance in flow cytometry and Michel Kester for providing us with tetramers. This work was supported by grants from the Dutch Cancer Society (KWF 2008-4018) and Radboud University Nijmegen (UMCN 2007-34). Hobo, W., Maas, F., Adisty, N., de Witte, T., Schaap, N., van der Voort, R. and Dolstra, H. (2010). siRNA silencing of PD-L1 and PD-L2 on dendritic cells augments expansion and function of minor histocompatibility antigen-specific CD8+ T cells. Blood 116(22): 4501-4511. Hobo, W., Norde, W. J., Schaap, N., Fredrix, H., Maas, F., Schellens, K., Falkenburg, J. H., Korman, A. J., Olive, D., van der Voort, R. and Dolstra, H. (2012). B and T lymphocyte attenuator mediates inhibition of tumor-reactive CD8+ T cells in patients after allogeneic stem cell transplantation. J Immunol 189(1): 39-49. How to cite: Hobo, W., Norde, W. and Dolstra, H. (2012). Ex vivo Human Antigen-specific T Cell Proliferation and Degranulation. Bio-protocol 2(23): e304. DOI: 10.21769/BioProtoc.304.